Quick Definition: Barriers to entry are obstacles which make it difficult for new firms to enter a market. Barriers to entry are the factors that make it difficult for firms to enter and compete in a market. 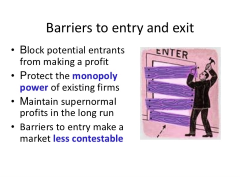 Barriers to entry are a characteristic of an imperfectly competitive market, such as a monopoly or an oligopoly, and are often used by firms to make a market less contestable. What are some examples of barriers to entry? Limit pricing – This is a method similar to predatory pricing. It is when firms set prices below a profitable level in order to put off other firms entering the market. Economies of scale – This is when a firm’s average costs fall because they are able to spread their fixed costs across a larger amount of production. Economies of scale is a barrier to entry because those firms who are already in the market will already have gained some economies of scale and will therefore have lower average costs than those wanting to enter the market. Start-up costs – Many markets require a large amount of resources in order for a firm to compete in it. This is a barrier because it means firms have to raise a large amount of capital, either through selling shares or borrowing from a bank, in order to enter the market. Sunk costs – Sunk costs are the costs that a firm cannot recover if they are forced to exit a market. High sunk costs in a market are a deterrent because if a firm wants to exit a market because it is not making enough profit, it will lose a lot of money from the sunk costs. As a result, sunk costs make it difficult for firms to freely enter and exit markets. Research and development (R&D) – There are many markets that are constantly changing which means firms need to spend a lot of resources on the research and development of new products and processes. Such markets put many firms off from entering due to the large amount of resources needed for R&D. Intellectual property rights – In many markets, firms have patents on their inventions, meaning they can market a product for 20 years without any competition. Brand loyalty – Loyalty to a particular brand or company also makes it difficult for firms that often have no reputation to enter a market and attract a lot of sales. Inelastic demand – Some markets have inelastic demand, i.e. when a fall in a product’s price has very little impact on the demand for that product. In these cases, it can be very difficult for firms to enter by using low prices as a method to attract sales. Government regulation – Some markets are heavy regulated and have a lot of government bureaucracy. In these situations firms may feel the costs associated to regulation are too high for them to make a good profit in the market. Concentration ratio – A measure of the extent to which a market is dominated by large firms (or not). This is found by adding the market shares of the largest three to five firms. Economies of scale – This is when a firms average costs decrease due to an increase in output. Monopoly – A market in which there is a single supplier. In the UK having 25% (or more) of market is seen as an indicator of monopoly power. Monopoly power – This is the ability to determine price or quantity of output without having to consider competitors and their actions. Sunk costs – These are the costs of a business that cannot be recovered. Even if a business stops operating, sunk costs can never be restored.